Safe and clean to use with no fire risk, excellent for use around flammable materials or open insulation. One XL fogger will treat an area of over 400 cubic m.
The Pest Expert Formula ‘P+’ Cluster Fly XL Power Fogger is a powerful super-sized aerosol fumigation device, designed for the rapid knockdown of cluster fly infestations. Once activated the Formula ‘P+’ XL Foggers release a powerful insecticide called pyrethrum, which is 100% natural and leaves no visible deposits both during and after use, as such is perfect for treatment in rooms containing furniture or stored goods. The pyrethrum gas released will work its way around the room killing all cluster flies present at the time of treatment. Formula ‘P+’ XL Foggers work in the same way to the traditional smoke bomb, however they require no naked flame to activate, making the Fogger first choice in rooms with open insulation or flammable materials. One 530ml XL fogger will treat an area of over 400m3, approx. Perfect for larger loft spaces or open plan rooms. 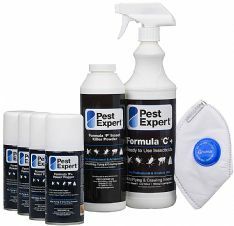 As the foggers have no lasting effect once the gas has dispersed, to maintain long term cluster fly control fumigation should ideally be paired with a residual insecticide, such as the Pest Expert Formula ‘C’ Cluster Fly Spray or Pest Expert Formula ‘P’ Cluster Fly Powder. Please also see our complete Cluster Fly Treatment Packs which contain Cluster Fly Spray, Foggers and Cluster Fly Powder along with a Safety Mask and Gloves and comprehensive cluster fly treatment instructions.